Taiwan President Tsai Ing-wen says the Hong Kong example is deeply concerning. It is a good case study for Taiwan. Taiwan's President Tsai Ing-wen vowed on Wednesday to ensure the island's defence as she warned of lessons from Hong Kong, saying Beijing will not allow freedoms in territories it controls, AFP reports. 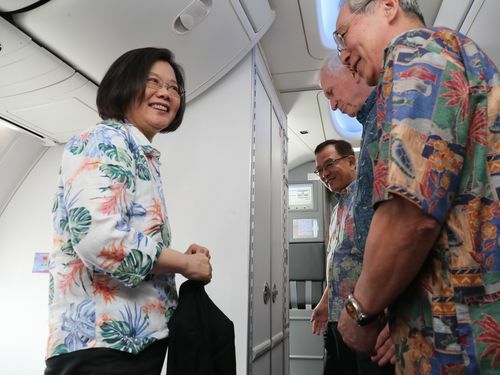 Tsai was speaking as she made a transit stop in Hawaii during a tour of three Pacific island nations that are among the dwindling allies that recognise Taipei rather than communist China. Beijing, which considers the self-ruling democratic island a province awaiting reunification, protested to the United States for allowing the stopover by Ms Tsai, who similarly transited through Los Angeles and Houston last year. In remarks delivered from Hawaii by video to the Heritage Foundation, a conservative think tank in Washington, Tsai accused China of stepping up efforts to "alter the status quo" and to "undermine our democratic institutions. ""China's actions have underscored the need for Taiwan to increase our self-defense and deterrence capabilities," she said. "To be clear, we seek peace, not hostility. But we must be capable of defending our freedom, democracy and way of life," she said. Tsai, whose Democratic Progressive Party emphasises Taiwan's separate identity, warned that the island should heed lessons from Hong Kong, where Beijing has tightened its grip against dissent, including banning a pro-independence party. China guaranteed rights including freedom of expression under its "one nation, two systems" principle - also proposed in the past for Taiwan - when it assumed control of the former British colony in 1997. "The Hong Kong example is deeply concerning. It is a good case study for Taiwan," Ms Tsai said. "It reflects that democracy is inherently incompatible with the Chinese regime, especially the CCP system," she said, referring to the Chinese Communist Party.